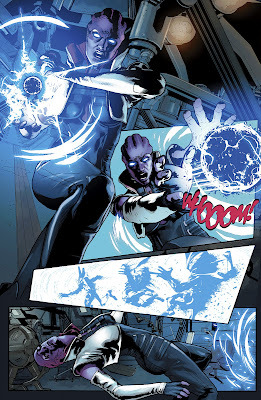 The war for Omega rages on: Aria T’Loak, de-facto ruler of Omega, teams with the vaunted pro-human organization Cerberus to stop an experiment gone wrong – something Cerberus has done on more than one occasion. Dark Horse’s Mass Effect four-issue comic is meant to bridge some gaps in between Mass Effect’s 2 and 3 respectively. Telling the fall of Omega, the seedy, lawless space station. It’s more or less a side story that will have larger face value upon Mass Effect 3’s release next year, one would think. Mass Effect Invasion seems to serve mostly as a companion piece to Mass Effect 3…nothing else can explain the obscenely predictable story. Personally I question the infatuation with Aria T’Loak as a character. Of all the people in the Mass Effect universe to focus on it seems odd that Aria has become a poster for spinoffs. Outside of her constant scowling what is here actual personality? Why her? It makes following Mass Effect Invasion entirely dependent on your love for the video game franchise. As a standalone comic, it’s flat. At some point Aria shoots a Kamehameha...so, that happens. You do get a few squeezings of things to come. The first two issues just don’t piece together a strong emotional resonance. Why should I care about Omega being taken over? And the betrayal that is so transparent from the start is almost laughably strung out. Cerberus wants Omega. If Aria were so smart she’d see all this as a ruse to get her away from her beloved home. Everything just feels so stale. From the static art: visuals that just show people standing around with no semblance of any artistic angle to liven up the panel. And dialogue that’s like reading the nutritional facts on a cereal box – I strain my brain trying to figure out the logic for why this, of all the many interconnected stories that could be thrown in between Mass Effect 2 and 3, needed to be told? I may hold some reserved feelings about the potential ending to his 4-issue comic run: in that I think readers may be surprised when we come to the eventual climax. 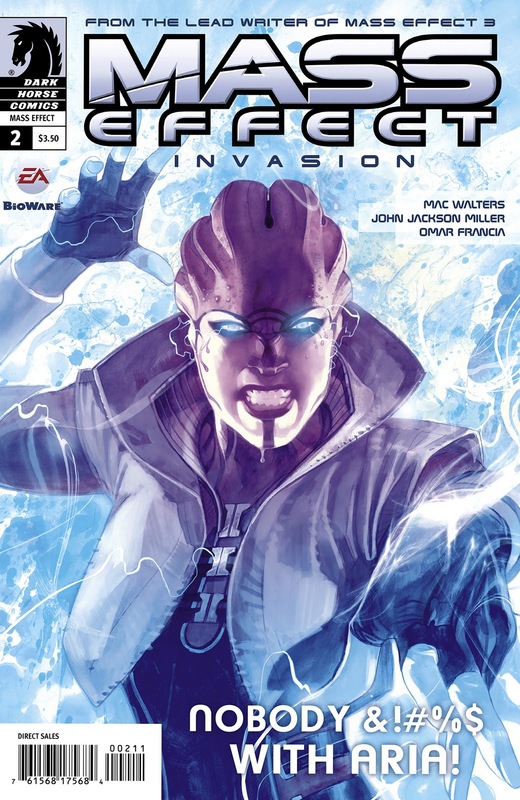 To this point each panel is dull and the trade as a whole is bland -- Mass Effect, as a series is full of classic Sci-Fi space exploration that keeps you on your toes and eager for more; Mass Effect Invasion is just…blah!